Once dubbed by American writer Pete Hamill as ‘our most famous immigrant’, the Statue of Liberty (or Liberty Enlightening the World) stands astride the transition between 19th and 20th century politics and culture. In its scale and its symbolic attributes, it shares a heritage with the historical ‘big things’ of antiquity such as the Colossus of Rhodes and predates the latter-day proliferation across the United States and around the world of large-scale structures driven by commercial incentive. It has since become one of the most repurposed and reproduced figures in human culture. image by Angela Mottee, eyejamdesign. Inspired by the writings of French political figure Édouard René de Laboulaye, sculptor Frederic-Auguste Bartholdi’s and builder Alexandre-Gustave Eiffel’s statue was gifted to the United States by the French government in celebration of their shared philosophical principles, and funded through donations from the American public. Bartholdi’s design alludes to classical republican ideals through its evocation of the feminine personification of America, Columbia, and the Roman goddess Libertas, embracing the mythic dimension of antiquity to place it explicitly in the neoclassical tradition. 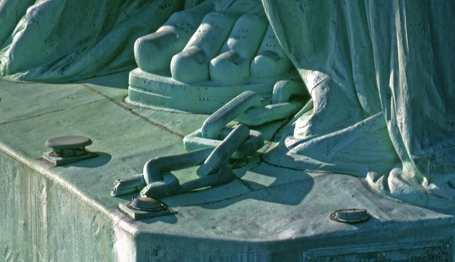 In a metonymic extension covering emancipation (the broken chain around its feet), enlightenment (the torch it bears), romantic self-reliance (in the statue’s uncompromising visage), and law and reason (via the tabula ansata, the tablet which bears the date of the US Declaration of Independence), the Statue of Liberty personifies the highest ideals of the Enlightenment, and consequently its rationalist conception of self-hood – the individual’s right to think and move freely across the earth, beholden to no oppressor. Ironically, however, despite being a gesture that also served to honour the Emancipation Proclamation issued by Lincoln, African Americans have never fully embraced the Statue as representative of their struggle, given the sustained persecution they would continue to experience after its dedication. The Tabula Ansata. Image by the author. Measuring 305 feet (93 meters, including its fortress-like pedestal) in height on completion, it stood higher than the second Trinity Church, the tallest Manhattan building of the time, which measured at 279ft including its spire. The statue’s original copper housing weathered quickly and dramatically, due to oxidisation – creating a patina or verdigris which ‘softened the outlines of the Statue and made it beautiful’, according to an Army Corp Engineers report from the early 1900’s. Such colouration has since become as characteristic as any element of its original design, and while the spectacle of its size is difficult to imagine now in an age of mega-structures, the impact of its appearance upon new arrivals of the time is a matter of record. Lady Liberty has come to occupy a central place in the global imagination due to its symbolic promise for immigrants to the United States, and the opportunities it presents to those fleeing persecution or pursuing fortune. America, the Statue seems to say, will reward you for your consent and participation in its great project (and whether that project is democracy, or corporate capitalism is an ongoing , heated discussion) – the New World awaits you. Emma Lazarus’ poem ‘The New Colossus’ helped to cement its status as a symbol of the migrant experience. 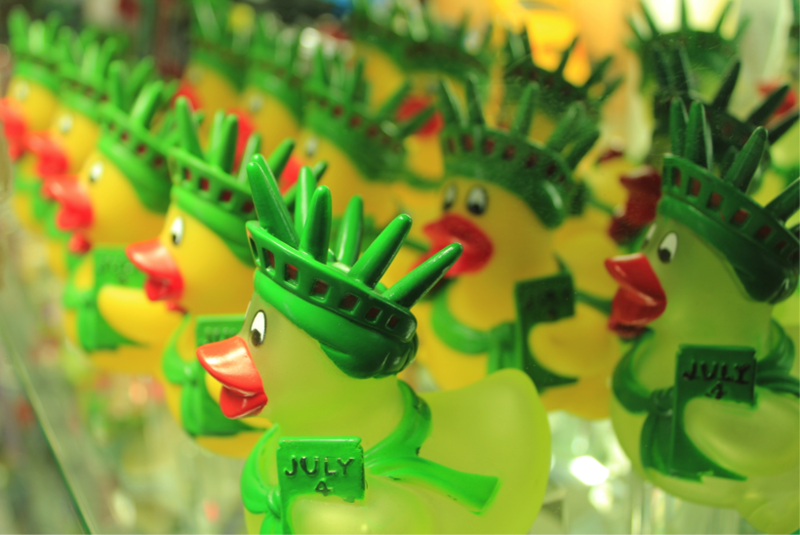 As one Greek immigrant recalls: ‘I saw the Statue of Liberty. And I said to myself, “Lady, you’re such a beautiful! [sic] You opened your arms and you get all the foreigners here. Give me a chance to prove that I am worth it, to do something, to be someone in America.” And always that statue was on my mind’. It could be argued that this desire to live up to the promise and ideals communicated by the Statue’s iconography represents a specific instance of the kind of ‘prestigious imitation’ that is more typically associated with the Romantic travellers of the 19th century, and the Grand Tour. 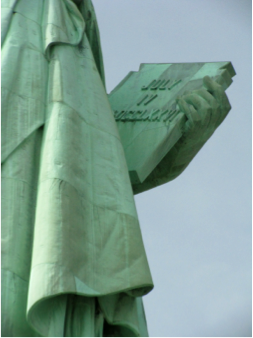 Today, US citizens and foreign visitors alike visit Liberty Island to reflect on history, on the promise of an enlightened world, and to contextualise the American story for themselves, with the net result being that the statue elicits a certain secular religiosity that fulfils Bartholdi’s hope and vision for it as a site of future pilgrimage. Similarly, it occupies a totemic position in the American imagination, communicating an ideal of America that perhaps the country is not always capable of realising. The statue, with all its size and mass, is ineffably bound to the intangible hopes and fears of all those under the spell of Liberty. With around 2.8 million visitors making the ferry ride to Liberty Island in 2012, such statistics no doubt stand as inspiration to those who, in a classic contemporary instance of ‘Big Thing’ thinking, now seek the reconstruction of the Colossus of Rhodes to draw the tourist dollar to their shores.